6 TB butter (or more, if it’s been a stressful week. Prep Day: Peel and then boil potatoes till fork spears them easily. Mash potatoes by hand, beater or potato masher, but never use a food processor or blender as this will lead to over mashing (another leading cause of gooey potatoes.) Add in all ingredients. Spread in 9×13 baking dish. Either refrigerate for later, freeze, or bake immediately. Crock Pot Directions: If you need oven room, replace baking with crock pot option. If mixing by hand, just do everything in the crock pot with only one dish to wash. Follow the directions, but instead of baking, cook in crock pot on low 2-3 hours (or 6-7 if needed, yes, sometimes I’m gone all day and it’s necessary). Add in a few extra tablespoons of butter and a bit of milk for creaminess. Bake Immediate Option: at 350 degrees for 25 minutes. Uncover, add a few pats of butter to the top and bake an additional 20 minutes or until thoroughly heated (heating time will vary). Serve immediately. 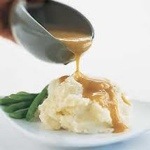 Serve Day – (If mashed potatoes were refrigerated, let stand at room temperature first.). If they were frozen, take out night before and thaw. bake in oven for 30 minutes. Please note that after they are thawed they will look really watering and you might panic. This is normal. As you stir during the process, they will come back to their original consistency, no worries. Add more butter, sour cream, and cheese if you would like. Wow! How could such an easy recipe take so many words to describe. Prep Day: In a large skillet, melt butter, then whisk the flour into the butter. Just as the flour begins to brown, begin slowly adding broth, whisking to prevent lumps. Once all stock is in, bring to a boil while continuing to whisk. Remove skillet from heat, season with salt and pepper if desired. Allow to cool and freeze in portions. If you want single servings, freeze in an ice cube tray, then store in ziploc once frozen. Serve Day: Simply defrost and heat.